← Perimeter students: We want to hear from you! 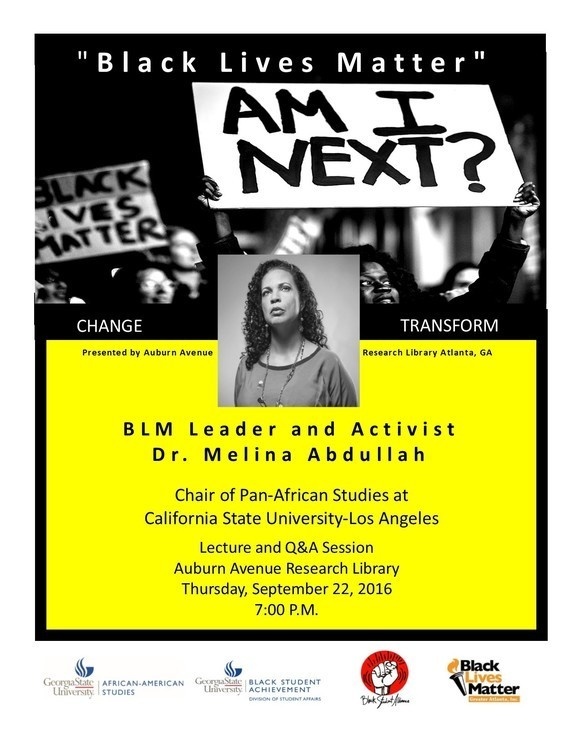 Dr. Melina Abdullah, founding organizer of the Black Lives Matter Movement and chair of the Pan-African Studies Department at California State University, Los Angeles, speaks on Thursday, September 22 at 7 p.m. at the newly renovated Auburn Avenue Research Library, 101 Auburn Avenue NE (across the street from Centennial Hall on the Atlanta campus). This community discussion will explore the origins and ongoing evolution of “Black Lives Matter,” tracing its transformation from a social media phenomenon to “a powerful affirmation of black humanity and global human rights clarion call for this generation.” The event is being hosted by the newly renovated Auburn Avenue Research Library in collaboration with Georgia State’s Department of African-American Studies. Dr. Abdullah is Professor and Chair of Pan-African Studies at California State University, Los Angeles and immediate past campus president and current Council for Affirmative Action Chair for the California Faculty Association (the faculty union). Dr. Abdullah earned her PhD from the University of Southern California in Political Science and her BA from Howard University in African-American Studies. She was appointed to the Los Angeles County Human Relations Commission in 2014 and is a recognized expert on race relations. Abdullah is the author of numerous articles and book chapters, with subjects ranging from political coalition building to womanist mothering. What binds her research together is a focus on power allocation and societal transformation. She is currently writing a book manuscript that examines Hip Hop and political mobilization. Professor Abdullah is a womanist scholar-activist—recognizing that the role that she plays in the academy is intrinsically linked to broader struggles for the liberation of oppressed people. Abdullah serves on the leadership team for #BlackLivesMatter and is committed to ending state-sponsored and police violence towards all people, and especially Black people. She has been particularly active in the resistance movement that emerged following the killings of Oscar Grant, Trayvon Martin and Michael Brown in California as well as in Ferguson, Missouri. Professor Abdullah emerged as a national leader in the effort to advance ethnic studies. She is a member of the California State University Chancellor’s Taskforce for the Advancement of Ethnic Studies. Dr. Abdullah serves on leadership boards for the Los Angeles African American Women’s Public Policy Institute (LAAAWPPI), Black Community, Clergy and Labor Alliance (BCCLA), Strategic Concepts in Organizing and Policy Education (SCOPE) and The Reverence Wellness Salon. She is active in political and community organizing, and frequently delivers public lectures and contributes to radio news programs, print and on-line media. Melina is a member of the Beautiful Struggle collective and co-hosts/co-produces a weekly radio show of the same name which airs on KPFK (90.7 FM) and streams worldwide. (from California State University Los Angeles Pan-African Studies Department site). “To Start from the Beginning: The Movement Has a History,” Against the Current 177, (July/August 2015): 15-17. “Womanist Mothering: Loving and Raising the Revolution,” Western Journal of Black Studies, 36, no. 1 (Spring 2012): 57-67. “The Emergence of a Black Feminist Leadership Model, chapter in Black Women’s Intellectual Traditions: Speaking Their Minds, Kristin Waters and Carol B. Conaway, eds. This event is free and open to the public. For more information and a map, see the GSU’s official calendar entry here. This entry was posted in African American Studies, For Faculty, For Graduate Students, For Students and tagged Black Lives Matter, Ferguson Missouri. Bookmark the permalink.